- Cross platform relevancy - Inter-platform discord - Google's PageRank potentially upset by Facebook's Like button (CNN article). In essence, we find some key enablers for change - maturing cloud and application infrastructures, a variety of open standards and trusted online payment platforms. I'm sure there are several grass roots organizations looking to decentralize social networking - for example, the Diaspora Project has gained some attention over the last week and expresses the core philosophy very clearly and succinctly. 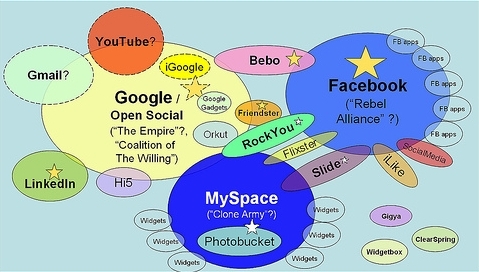 There is still much at play, before we have a clear picture of the new structures and landscape of social networking. Where things finally settle will be a fusion of these exciting ideas with an economic model that works. I believe, the most game-changing aspects will emerge from this intersection. We can't be sure of what this improved social environment will ultimately look like or how exactly we will get there. One thing I'm quite confident about, though, is the central roles data and the user will play. In order for this to work, the newly privacy-aware user must control and feel confident that their data is theirs. But the really critical piece will be how the user is motivated to be a cooperative player in the economic landscape they have been largely excluded from. We have kept users in the dark as this ad-based economy swirls about them. Users like free, but they hate ads. It's time to bring users into the mix, eyes wide open. They are the missing link to enable ongoing and improved revenue streams for advertisers and their privacy awareness will only continue to be refined. The wool is being lifted from their eyes, and it won't be long until they become active members of the currently - though not beyond saving - unholy trinity that is the publisher, consumer and advertiser relationship. The first step, as noted, is giving the user control over his or her data - whether it be user generated (UGC) or passively behavioral. The second will be to give them an incentive to relinquish and replenish that data. That incentive will come at a price. The user will come to realize that nothing is truly free. The challenge will be balancing what to give up and what there is to be gained. There have been recent use cases of this kind of user engagement from social media virtual currencies (social games) to YouTube's advertising rev-share with content creators. So I'm not thinking about how to bridge the advertiser and the publisher (who currently controls the data). I'm thinking about how to bridge the advertiser and the user (who creates the data). Whatever comes of Facebook's privacy fiasco, the gears are in motion... data to the people!